Spain's vibrant wine culture ranges from collectible, ageworthy reds to terrific values to storied Sherries and more. And with multiple vintages and styles on offer there's plenty of choices for adventurous wine lovers. 2016 Bordeaux Barrels: A free chart offers an alphabetical list of all 2016 Bordeaux Barrel tastings reviewed for the tasting report in this issue. Sherry: A free chart offers an alphabetical list of all Sherries wines reviewed for the tasting report in this issue. Brunello di Montalcino: A free chart offers an alphabetical list of all Brunello di Montalcino wines reviewed for the tasting report in this issue. FREE: Spain Alphabetical Listing - More than 650 wines were reviewed for this report. A free alphabetical list is available. WineSpectator.com members can access complete reviews for all the wines tasted using the online Wine Ratings Search. FREE: Sherry Alphabetical Listing - More than 70 wines were reviewed for this report. A free alphabetical list is available. WineSpectator.com members can access complete reviews for all the wines tasted using the online Wine Ratings Search. 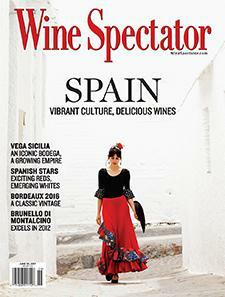 WineSpectator.com: BONUS VIDEOS SPAIN: Learn more about the wines and regions of Spain with out collection of videos from Ribera del Duero, Rioja, Priorat, Toro and beyond. FREE: 2016 Bordeaux Barrels Alphabetical Listing - More than 315 wines were reviewed for this report. A free alphabetical list is available. WineSpectator.com members can access complete reviews for all the wines tasted using the online Wine Ratings Search. FREE: Brunello di Montalcino Alphabetical Listing - More than 135 wines were reviewed for this report. A free alphabetical list is available. WineSpectator.com members can access complete reviews for all the wines tasted using the online Wine Ratings Search. WineSpectator.com: BONUS VIDEO Vega Sicilia Unico, at Spain's Pinnacle: Vega Sicilia's Pablo Álvarez presented his Unico 1994 at the 2011 Wine Spectator New York Wine Experience. WineSpectator.com: Members can reference our full archives of Mark Pendergrast's columns and other articles about coffee and tea. Matt Kramer - What's in a wineglass? WINE SPECTATOR'S 11TH ANNUAL VIDEO CONTEST Share your wine story to compete for great prizes! Submit your shorts to Wine Spectator's annual Video Contest and you could win tickets to our spectacular Wine Experience weekend or a Grand Tour tasting. Entry deadline is Monday, Sept. 4. Check out the rules and previous years' finalists online. OUTDOOR ENTERTAINING It's time to take your party to the backyard, beach or park, and some of the country's best chefs are here to help. We share their cooking tips and delicious make-at-home summer recipes along with great-value wine matches chosen by our editors. Brunello—When to Drink It, When to Decant It: Brunello is a big wine that can improve with age, and with decanting. When does top producer Emilia Nardi like to drink and decant hers? Quick Tip—Does Vine Age Matter? Find out what deep roots mean for Sangiovese vines in Tuscany. ADVANCE RATINGS NEWSLETTERS Get the early scoop on the best values and hottest collectibles from our editors' latest tastings. Insider: Weekly reviews of highly rated wines to seek out before they sell out. Advance: Sneak peeks at the top picks from upcoming issues of the magazine. 2016 BORDEAUX BARREL TASTINGS Which wines from the newest vintage will be worth buying en primeur, before they are bottled? After you read senior editor James Molesworth's tasting report in this issue, head online for his scores and full tasting notes for more than 300 reds, dry whites and sweet wines. Plus, get more of his impressions in his blogs from visits to top châteaus and estates. We'll also be tracking the 2016 futures campaign as prices are released.